With extensive knowhow in this domain, we are indulged in providing a supreme quality gamut of Pneumatic Diaphragm Valves. 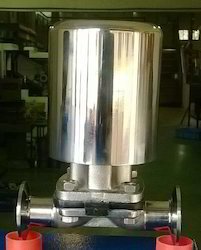 These valves are used in processing industries for steam, air or other fluids. Suitable for operation for simple on and off duty, using solenoid valve, or with pneumatic controllers with 3-15 psi loading pressure or as a direct operated regulator for controlled pressure up to 30 psi. We bring forth an excellent range of Pneumatic Diaphragm Valves for our esteemed clients that are known for its sturdy construction and for being dimensionally accurate. Standard: ISO, 3A, JIS, SMS, DIN. Actuators: Direct acting , Spring Return Type Diaphargm actuator, air to open or air to close type. Diaphragm: Fabric reinforced Neoprene rubber for strength and flexibility producing long cycling lifetime. Performed shape for added flexibility and linear response. Refer to the specifications table. Body Material: ASTM A351 CF3M (SS316L). Diaphragm & Multi Spring type, Air to Open / Air to Close as a standard (Piston actuators / Electrical actuator on request). Size Range: 1/4"" though 14"
Size Range: ½" to 12"